Could it be the hottest August Bank Holiday on record? The UK has enjoyed its hottest Early Spring Bank Holiday on record when temperatures passed 24°C by 10.30am. 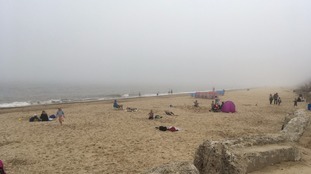 The area around The Wash was the hottest place in Britain on the record-breaking August Bank Holiday Monday. The Cambridgeshire town of March currently holds the record for the hottest late August Bank Holiday on record set in 1990. Stansted Airport expects over 220,000 passengers to pass through the terminal across the Easter bank holiday weekend as Brits head-off to sunnier climes and Europe's ski resorts. It's the busiest part of the year so far at the Essex airport has people also head in from aboard. Hundreds of thousands more air travellers will also take to the skies over the remainder of the week as new routes launch and many seasonal destinations return as the new summer flying schedule comes into operation.